The microscopic world is beautiful and fascinating, but those of us who aren’t molecular biologists rarely get to appreciate it. 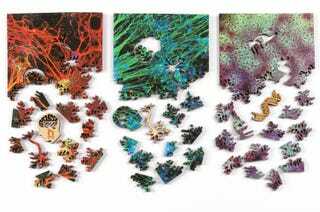 If you need a little more microscopic flair in your life and on your coffee table, you might want to check out these gorgeous, scientifically-accurate puzzles. Each of the seven puzzles is available in three sizes: 5” square ($30), 6” x 9” ($65), and 10” round ($100), and you can order them right now over at Nervous System’s online store.